I think that what i wanted to say haved been so nicely said and presented by Seadragon http://cafeoftheeast.blogspot.com/2007/02/pulut-tai-tai.html. 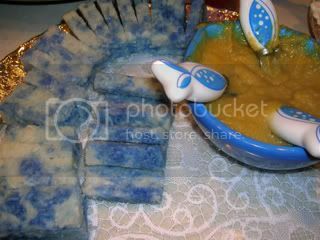 This is one of the classics of nyonya kuih and how organic can it be when the color blue is obtained from the flower 'Bunga Telang' which gives the special blue to marble the compressed rice. These flowers are hard to come by and they are not so treasured when you are in Malaysia , but here, it is different, friends who have treasured ingredients like this, share and i have the opportunity to get some from my dear friend, Sandra Ho, whose mom is in Malacca and dried some for her. Thanks to Sandra's mom. Remove 1/3 of the cooked glutinious rice into a mixing bowl, add a little of the blue bunga telang extract and mix well to obtain a blue glutinious rice. Add in the remaining 2/3 cooked glutinious rice and mix lightly to obtain a marble effect. Using a piece of banana leave, press glutinious rice into a 7 inch square cake pan which has been lined with banana leaves. Cut a piece of 7 inch square thick cardboard and cover it with heavy duty aluminium foil. Use this as a lid and press it down on top of the pressed glutinious rice. Use something heavy (i use a 6 inch saucepan filled with water) on top to weigh down cake until cool and firm. Instant Noodles enjoy a huge popularity in every asian homes around the world. The range of flavors are limitless and so too are their patrons. Students, overseas or in their homeland, busy or not so busy housewives, asian tourists, etc, all find great enjoyment in them. 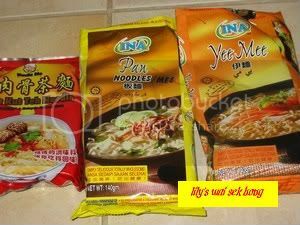 And me, I am a confessed Instant Noodle addict and the addiction progresses with new flavors .I have to thank Ray of http://mytasteofasia.com/ who sent me these 3 kinds to sample and i must say, i am hooked. They are Uncle Ho Bak Kut Teh Noodles, Ina Yee Mee and Ina Pan Noodles and thanks to him again, malaysians here in the States do not have to drool over these comforts from home but can purchase them online. There is need for suggestion as to how to cook or eat them, Instant speaks for itself, eat them as is, but by all means add vegetables , meat, fish balls, etc to make the meal more substantial if it is being served for lunch or dinner. Fill a big soup bowl 3/4 full of cold water. Using oven mittens, remove the splatter then the bowl of cooked noodles.